Unseasonably warm for a November day, we may even hit a record high! No coat necessary. 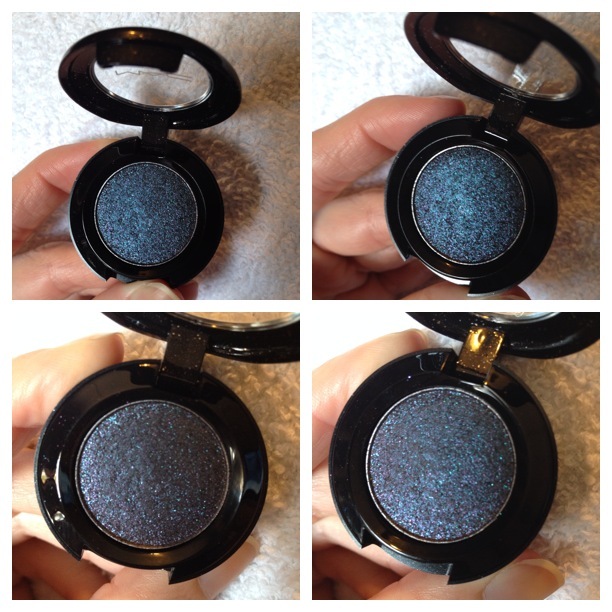 The MAC Heirloom Mix line is part of this years MAC holiday collection, and I am glad that the pressed pigment in the shade Enchantment (limited edition) is the only item that caught my eye from their holiday collection. I usually love just about every makeup brand holiday release and scamper about trying to order/find everything in store before it is gone, so this is a nice break not to have to worry about missing out for once. I purchased Enchantment on 10/19 when it went live online. This is the only item that has sold out online so far, so I’m glad I ordered right away. It seems others feel the same as me about the less than stellar holiday collection considering it is still very available. It is now available in stores as well. Pressed Pigments are priced at $19.50, which is slightly less than the traditional $21 pressed pigments, but you are getting much less, adding to my reluctance to purchase additional items from this collection. Regular pressed pigments contain .10 oz. of product, and the pigments in this collection weigh in at just .04 oz. They are less than half the size and almost the same price. I can’t say they’re something I’ll use so often as to run out, even at the smaller size, so I guess it doesn’t matter all that much, but I can’t help but feel a little taken by this smaller size. The packaging is pretty, glossy with flecks of silver glitter, but I don’t feel it makes up for skimping on product. 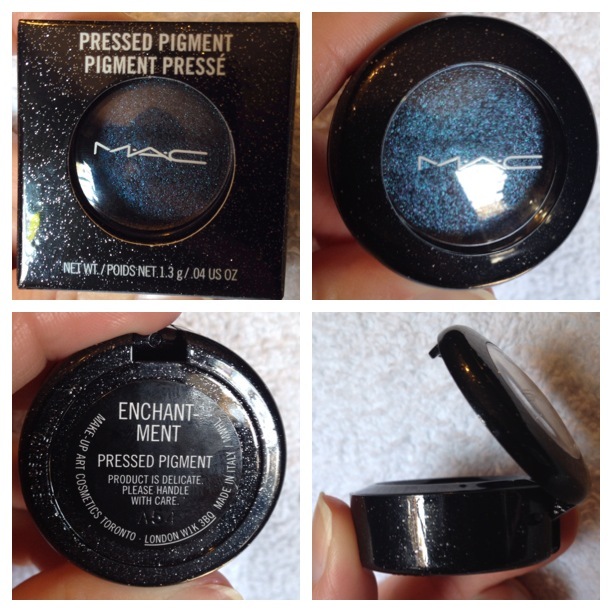 Enchantment looks like a mix of blue and purple glitter in the package. 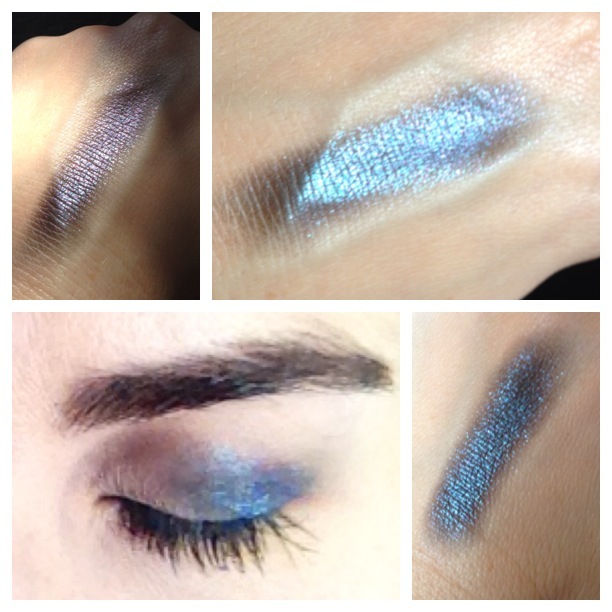 My initial swatch felt hard and dry so I didn’t think it would apply well, but it surprisingly went on very nicely. I sprayed my brush with water and then wiggled firmly onto the shadow to get it onto my brush. It certainly isn’t creamy or smooth in any way so it does take a bit of effort to snag some product. 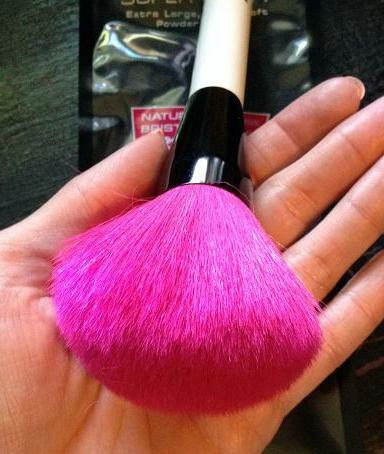 When I applied, it went on very smoothly, just like the loose pigments, and it blended well too. I had absolutely no issues with application at all so don’t let the texture deter you if you like these colors. I had absolutely NO FALLOUT with this! It does contain micro glitter so I was sure there would be at least a little, but nope. None. It lasted well all day with no setting spray. I did use my Camel Coat Paint Pot as a base to help it adhere. Pros: Applies nicely, no fallout, blends well, long lasting. Cons: Texture is hard in the packaging, overpriced for the size. Cost: $19.50 for .04 oz. 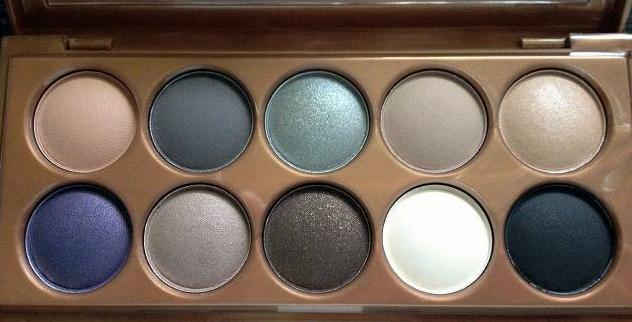 Available at: MAC Cosmetics or MAC stores/counters. Rich brown, navy, pumpkin and burgundy are some of my favorite fall colors and they all blend together nicely. I also love knee and over the knee socks, I wear them with skinny jeans and skirts all fall and winter. This outfit is all old pieces that I put together in a new way. 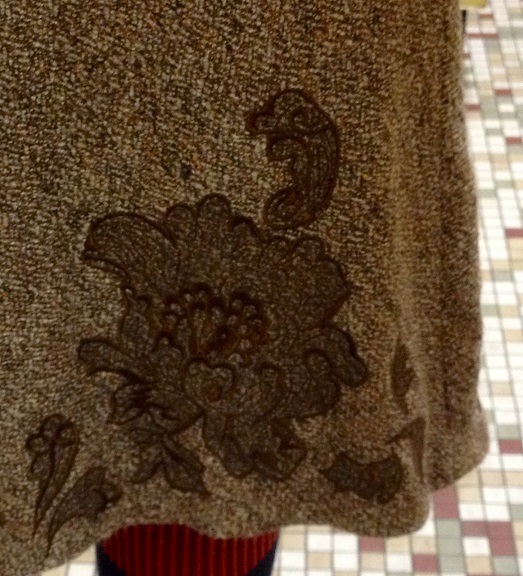 The skirt is literally 15 years old! Lipstick: MAC Whirl Lip Pencil & Twig Lipstick. 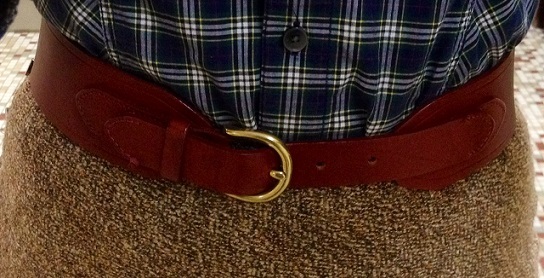 Belt is from J. Crew Factory. Booties are from Ugg Australia. First, StyleBook is an app that allows you to catalog everything in your closet. You can put outfits together for each day of the week (or month) using their calendar option, make a packing list by creating looks for vacation, add style inspiration photos from the web and a whole lot more. Initially, you need to take photos of your clothing and upload it into the app (it allows for unlimited storage) which is somewhat time consuming, but once that is done it is so worth the initial time investment. I have saved so much time in the long run by picking my outfits for the week through my app while I have an extra couple of minutes here and there. I also used the travel feature to create a packing list for my trip last weekend and I saved all my “looks” for each day of the trip so I knew exactly what to wear without having to dig through my suitcase and try to remember what goes with what. Taking the photos: you have to have a white background and good lighting so the app is able to clear all that extra space away. I didn’t want to use my nice sheets so I picked up a yard of clearance fabric at Walmart for $2 and used that. It does have difficulty discerning between the background and white clothing, but there is a manual edit option that allows you to crop the background out yourself for those items. I am still working on completing my virtual closet but I’m almost there. I have all the hanging items uploaded and half of my shoes, all of my jewelry and some of my makeup (yeah, I’m adding my makeup too so I can put that on my virtual packing list). Still need to add shorts, jeans, accessories and outerwear. You can check out the website to learn more about the app: www.stylebookapp.com. For those of you who don’t use Iphones, or if you prefer to choose outfits/pack via a paper list, I have a great link to a printable outfit planner! I use the paper version before the app sometimes, as I really like them both. The PopSugar link to the article containing the printable planner is here and the direct link to the printable pdf is here. Also, be sure to check out my packing list post here. 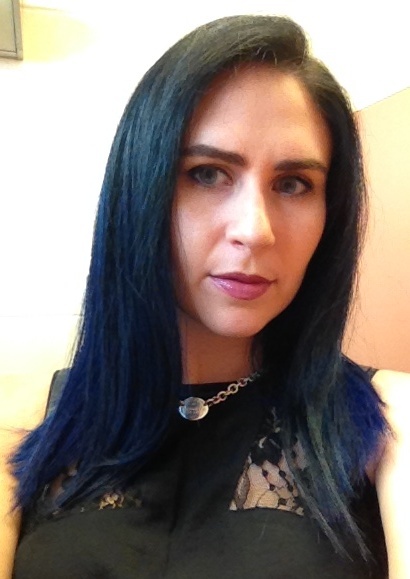 On another note, my hair is now blue ombre thanks to April at Elle Salon! I’ve been wanting to do this for a long time and am so happy with how it turned out. If you’re in central PA, be sure to check out the salon. We used a custom blend of Pravana colors and so far it’s holding up great with no staining casualties! Even my white pillow cases are stain free. 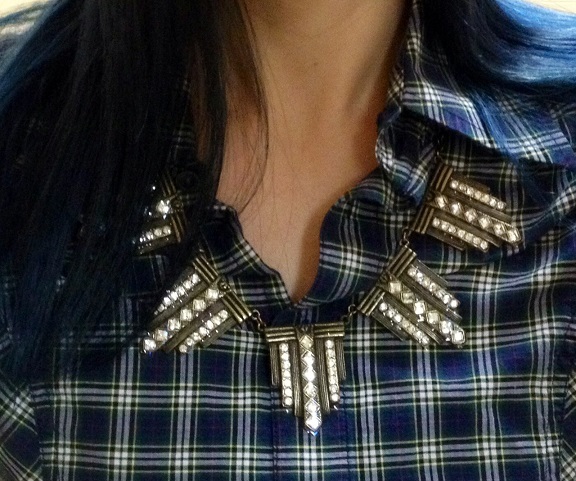 Shirt: Express, new and still available. 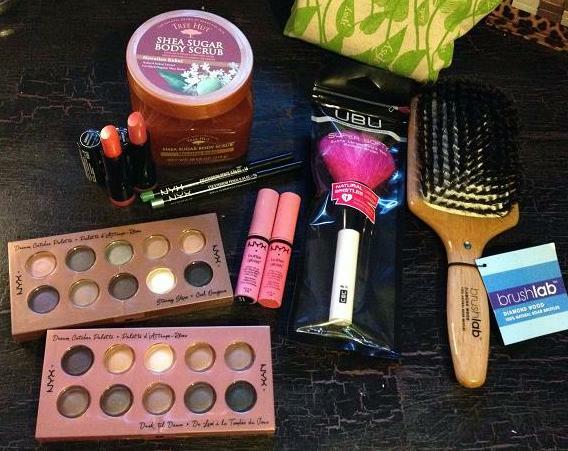 Here is part two of my spring beauty haul! More NYX stuff (love my NYX) and some random items I found while browsing at Ulta. 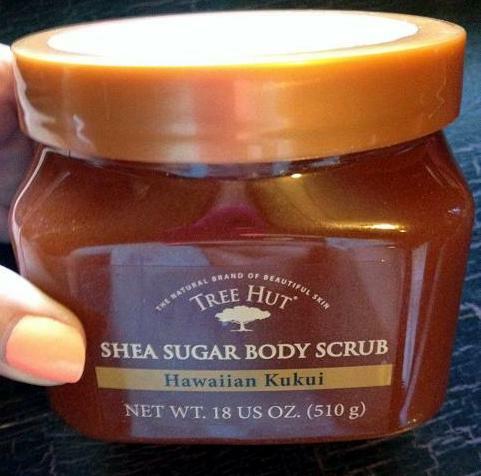 I had no business getting a third body scrub right now, but this smelled so amazing, I just couldn’t pass it up. The Original scent smelled really great too, sort of like a nutty, buttery, shea butter smell, but I went with this one since it had a touch of tropical to it. At under $8 it was a steal. 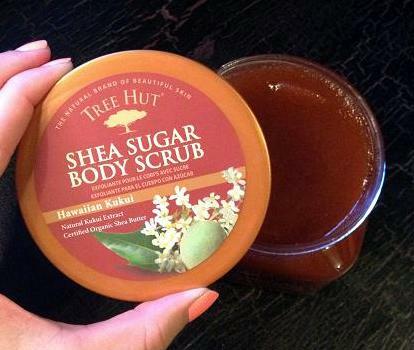 My other body scrubs cost twice that for half the amount of product, so if I like this, I plan to rotate between this fragrance and the original one. They had many others as well but those were the two I loved. 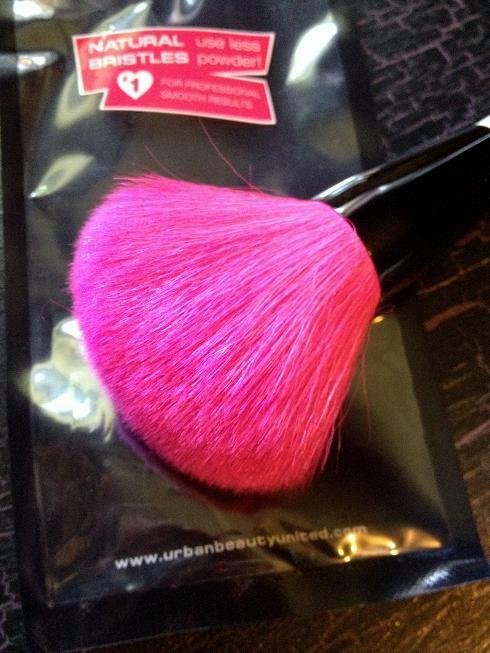 This is a face brush from UBU, which is a Tweezerman company. They had one of these on display and it felt amazing so I had to get it, it was only $10 and was actually something I needed, plus, it’s pink! It does an amazing job and is so soft on my face. It was a bargain and well worth more than what I paid. 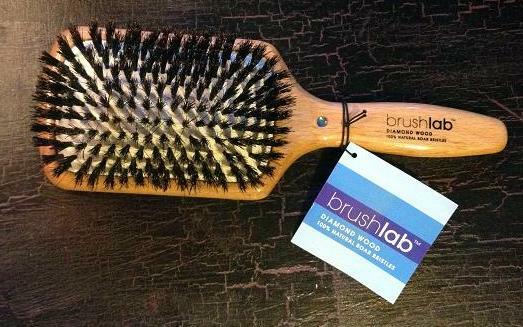 This is the Brush Lab Boar Bristle Brush specifically made for detangling medium to long hair. This is the first boar bristle brush I’ve owned, and let me tell you, it’s wonderful! My hair never gets snagged in it and it is so gentile, yet does the job. I’m so glad I grabbed this for $15. I don’t think I’ll ever be going back to plastic brushes again. 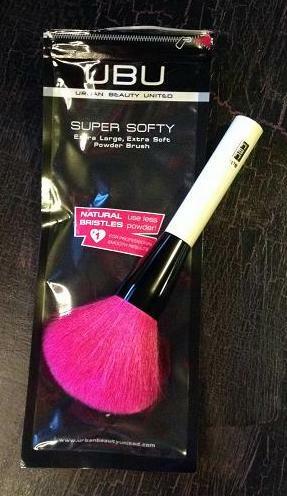 If anyone knows of a good travel sized boar bristle brush, please let me know where to find it. 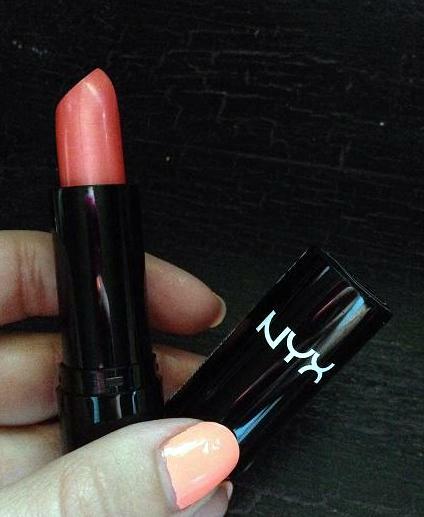 I picked up two more NYX Creamy Round Lipsticks (original review here) in the colors Margarita, shown above, and Fig. 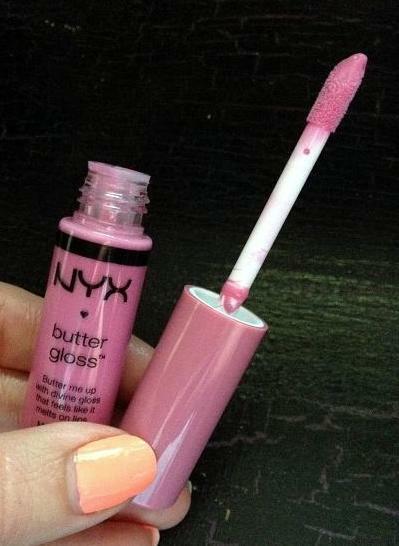 Also picked up two more NYX Butter Glosses (original review here) in Merenge, shown above, and Strawberries and Cream. 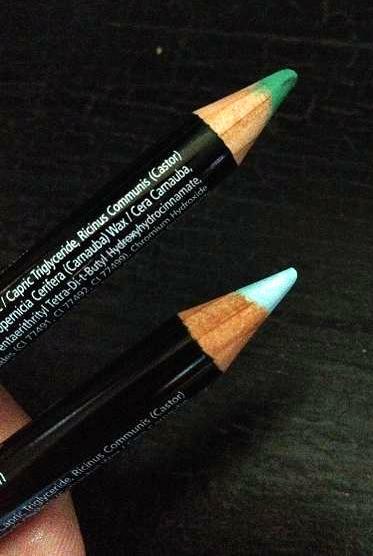 I added two more NYX Eye Pencils to my collection in the colors Teal and Baby Blue. I have been using the black and white versions a lot more lately and have really grown to love them. Initially I wasn’t that impressed because the color is very soft, so it’s not going to give a precise, crisp looking color, but I love them to accent my lower lashes. I do that a lot in the summer since I’m wearing less makeup. 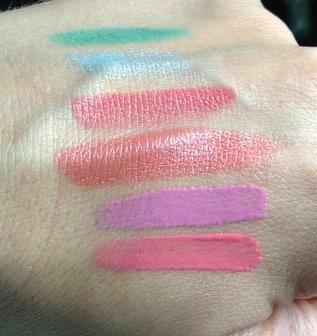 Swatches shown above are the NYX products: eye liners in Teal and Baby Blue, Creamy Round Lipsticks in Fig and Margarita, Butter Glosses in Merenge and Strawberries and Cream. I also picked up these two NYX shadow palettes in Stormy Skies and Dusk til Dawn. 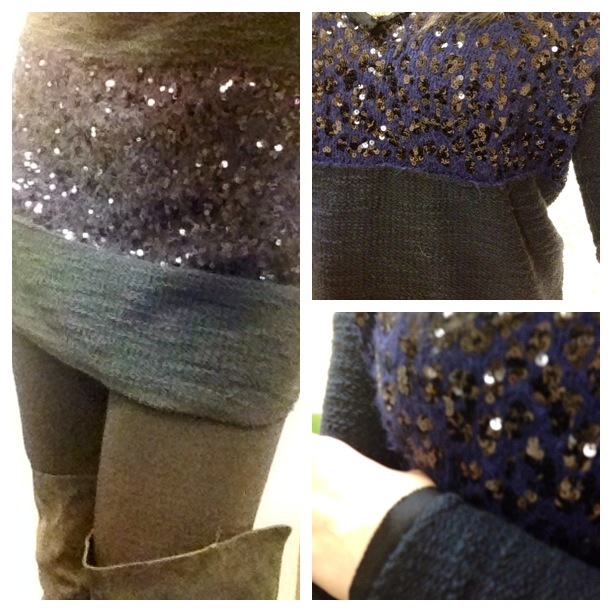 I love them, the colors are amazing and I’ve been wearing them every day since I got them. They also had another one called Golden Horizons but those colors had more of an orange, sunset theme and weren’t colors I wear often. These were $14 each. 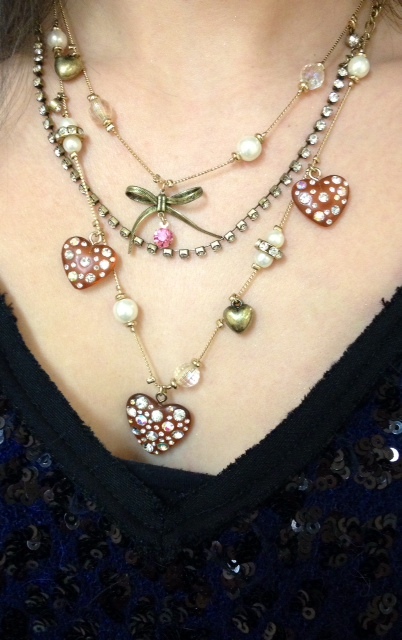 I also got this necklace from the ShopLately seller OpaqueLion. It was my first purchase from ShopLately and I am very happy with it. 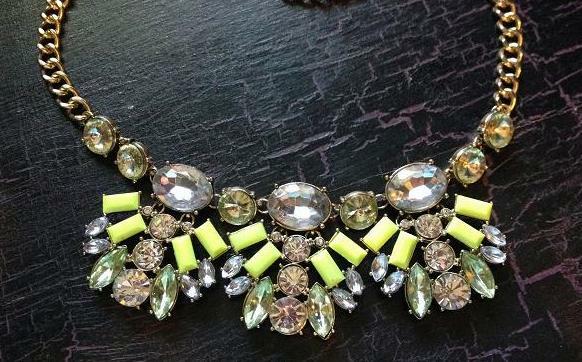 This is similar to the Bauble Bar jewelry in style and quality but it was only $18. It came in three days and was well packaged. I plan to purchase from OpaqueLion in the future. I also ordered another necklace from a different seller but that has not arrived yet. Thanks for reading part two of my spring beauty haul. Take a look at part one if you haven’t already. Let me know if there is something I need to try!